My vessel is a fairly basic Albin 25, much of the time solo. Planning for a longer adventure(s), again, possibly solo. I am not in the greatest condition ( I am a youthful 67) and when weeds need to be hauled up by hand my heart and lungs leave me panting. I am concerned about being caught in an emergency situation with the need for a quick anchoring or weighing, sometimes repeatedly, and wishing for the assist of a windlass. With the A25 running about 6-7000 lbs I am looking at something like the Powerwinch Powerwinch - Freefall Anchor Windlasses which has 450 lbs pulling power. Loved the boat and used it a lot out here. Very sturdy and seaworthy vessels! Nice to see you posting again Sunset, I've missed seeing you here. Glad to see you're also still enjoying the Albin. Yours is probably the "best bought" boat I've ever seen on this forum. Can't imagine picking up a nicer boat for less. Good luck with your windlass project. I have 2 Bruce-type anchors with 150 ft of rope and 15 feet chain each. No deep anchorages. After posting above I notice that some consumer reviewers complain that the Powerwinch broke on the first few lifts because of a plastic part. So that points me more toward the Lewmar. When I was shopping for my windlass I called a place that rebuilds windlasses. I knew the gentleman would know what unit he would rather overhaul. I asked which he wanted to rebuild in five years and then shut up. Thanks Janice - I enjoyed the tale! I have a Lewmar pro 700 windlass on Tortuga. That windlass uses 1/4" G4 (HT) chain. It is quite adequate for my 32' boat and will be more than enough for an Albin 25. I find that the rope/chain gypsy works well with my mixed rode (150' chain spliced to 200' 1/2" 3 strand nylon.). Your boat would also be fine with the Lewmar ProSport 550 which can be had for under $500. It also uses 1/4" chain which will hold your boat. The ProSport fits more easily into my budget. My chain (both) is 3/8 but I suppose the wise course is to simply get the chain/rope combo to fit anew and keep the existing setup for backup situations. I ended up ordering the Pro Sport 550 because of price and seeming ease of use from the helm. I don't know what kind of switch it will come with. I also ordered the matching rope/chain combo. I think one of my 2 chains is 1/4 inch rather than 3/8 so I want to know if it is possible to link my 15 ft of chain to the 10 ft coming with my order. The I will have 25 ft of chain and 150 ft of rope, and a spare claw (5 kg) with 3/8 chain and 2 x 100 ft of rope. Now to start figuring out the wiring needs and routes while waiting for delivery. I also need to reposition the large dowelled cleat on the bow. The large "dowelled cleat on the bow." is what the boat probably was designed to take the strain of the anchor loads while anchored. It needs to be fastened to the boat 5 or 50 times more robustly than the new windlass. The windlass just pulls the weight of the anchor to the deck for you , not hold the boat in a blow. I would leave it and find another spot for the windlass. I can't imagine another spot for the windlass than adjacent to the bow roller, so I will certainly be "anchoring" the repositioned cleat robustly. In addition to re-using the steel plate backing, I will also strengthen the mounting above deck. The cleat will be located right beside the windlass so that it will continue to serve the purpose you describe. This picture shows the limited options available on the foredeck. and a spare claw (5 kg) with 3/8 chain and 2 x 100 ft of rope. Now to start figuring out the wiring needs and routes while waiting for delivery. I also need to reposition the large dowelled cleat on the bow. I tried a similar combination. I had a 25 pound plow and was given 25' of 3/8" chain. The plow would not set. The weight of the chain pulled the plow over on its side. Rethink the 3/8" chain with a light weight anchor. It didn't work for me. You might notice the samson post is raised. Your cleat does not have to be directly on the deck. Just throwing that out as an option. Congratulations Sunset on the windlass selection. I'm sure it will be a wonderful addition to your boat. I love mine! The spare setup is even worse than what you describe: 3/8 chain with a 5 kg claw anchor. I've never used it. But my main anchor now will have a 22 lb anchor with 10 feet of chain (unless I extend the chain). And I have prepared the wood base for the windlass as below, leaving room to install the big cleat beside it. Today will tell if I can get the cleat's backing plate off. By hook or by crook! The windlass will work with 1/4" HT chain. The 3/8" chain won't fit the gypsy. 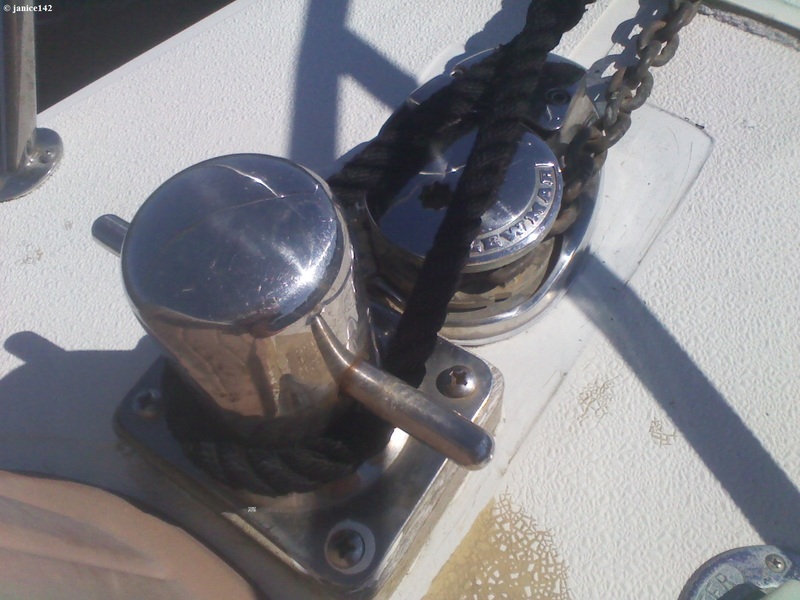 The 3/8 chain is for throwing in in a pinch, not for using on the windlass. It's on the boat because it came with. No use getting rid of it. That's a beautiful piece of wood Sunset. Like you Seaweed came with some 3/8" chain on an eleven pound knock-off Danforth style anchor. My chain was plastic coated. I put it on my Stop anchor and it works well. It's not good enough for every day (wouldn't fit on the windlass either) but for an occasional lunch hook, it is quite good enough. A friend suggested I get a much smaller lunch hook. Raising my 16 pound lunch hook with that 3/8" chain was a bit more than he expected when he volunteered to hoist the anchor for me. For the record: I did not ask him to do so. He also said he would not be hauling in that anchor ever again until I got something appropriately (meaning much smaller) sized for a lunch hook. He is right. I don't have a great system of hauling in the anchor when deployed from the transom. At lunch though I will say having the aft in facing the wind makes it much cooler inside. I have not yet given much though to a better means of raising the stern anchor. It's one of those niggling things that I will figure out in good time. In the meantime, I look forward to seeing your progress. Good luck getting those nuts off. A Dremel can eliminate the nuts if they won't cooperate for you. Thaks Janice - the wood is Makore - aka African Cherrywood. I've never before had the pleasure of working with such beautiful wood. An eye-opener! I chose it because I found the right sized short piece and was able to save money that way. $22.00. So I've made a lot of progress this weekend,so I'll post some progress pics below. The final pic is not the final installation - no caulking or nut-tightening yet. Just a dry fit. I took the cleat home because I need an additional half-inch on the bolts because of the stainless steel backing plate, over and above the inch I already added. No problem since I am making my own threaded bolts from a 3-foot threaded rod. Beautiful Sunset... that's a gorgeous plank. It's almost a shame to cover it up. Is your dinghy powered by an electric trolling motor? If so, how well does that work for you?